Let’s first clear the air by answering the question most will first ask. No, unfortunately the washing machine is the worst method in cleaning shoes. It can tear the construction and alter the structure of the shoe. The washing machine will destroy the shock absorption fibers and EVA foam in the mid-sole. This diminishes the longevity or durability of your running shoes. If you want a fast clean for your older shoes; Sure you certainly can throw them in the wash. Place the shoes in an old pillow case, place a mid weight towel inside to decrease noise and tie the top of the pillow case. Keep the wash on a gentle cycle and air dry them. Do not place them in the dryer or near a heater furnace. Give them at least 10 hours to air dry. 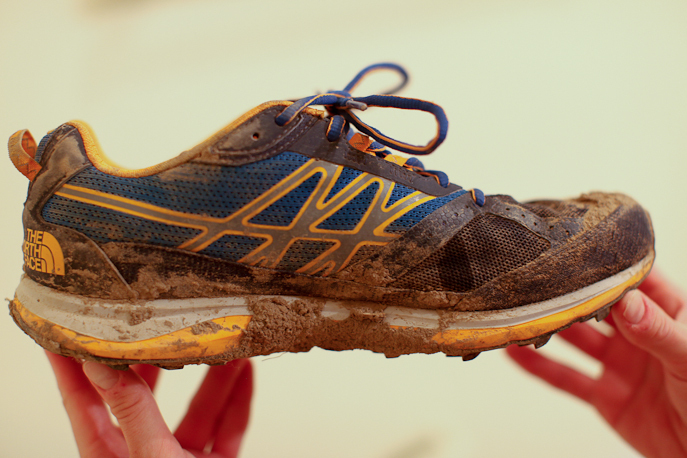 If your running shoes get covered with mud and dirt just hose them down with water. Then wipe them down with a towel and stuff newspaper inside. Then place them on their side to allow moisture to evaporate. Do not proceed any further shoe care steps until both shoes are completely dry. Never place shoes near a furnace to speed the drying process. This will warp the materials and alter their original form. Next, take a scrub brush or toothbrush to remove any debris. Take a shoe gel cleaning product or a washing liquid and dab the substance on the dirty stains. Gently wet a clean scrub brush and rub each stain in a circular motion repeatedly as needed. Reapply water and cleaner to the needed areas. Use a paper towel to remove dirty residue and additional water. Once the upper is clean pat dry with a slightly wet paper towel to remove any excess foam. Finally dry the upper portions with a towel. Wait what about the mid-sole? The same directions above can be utilized to clean stains on the mid-sole or outsole. However another easy cleaning method for the mid-sole is a Mr. Clean magic eraser. This is an excellent and straightforward method to remove marks. If that product is not available try a disinfectant wipe or a similar cleaning product. Please make sure shoes are completely dry before wear. If needed just keep recycling newspaper into the shoes as required. Good-looking shoes are one thing; good smelling shoes is something else altogether. There are hundreds of products to choose from when it comes to deodorizing your running shoes. We recommend going the natural route by avoiding harmful chemicals and toxins. One company that makes some good, natural cleaners and deodorizers is Melaleuca. Melaleuca products are powered by natural ingredients that are safe and effective. For deodorizing your shoes, we recommend spraying Sol-U-Mel inside and out after each use.